The Conservation Education Council is fostering stewardship by ensuring that residents of all ages have high quality opportunities to learn about all elements of the region’s ecosystems. 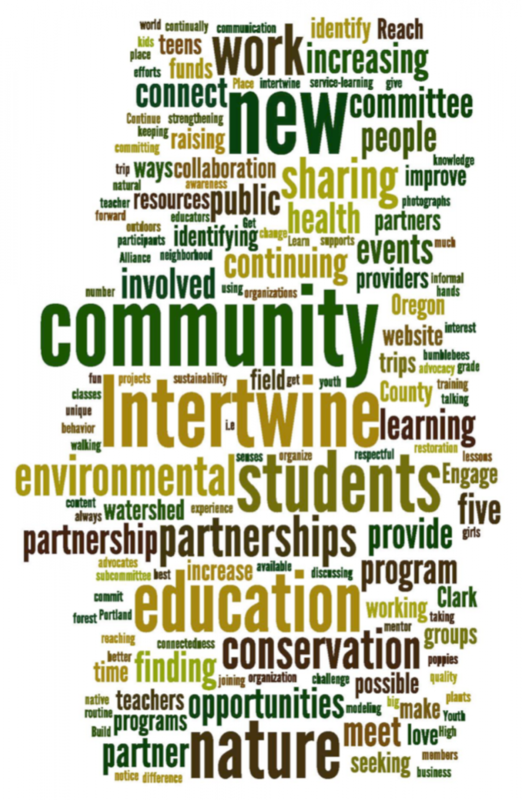 The Intertwine Conservation Education (Con Ed Council for short) Leadership Committees work to achieve the vision of everyone sharing a life-long connectedness to nature in the greater Portland region. The Funding Committee is dedicated to improving (and creating new) relationships between funders and programs in the conservation, environmental and sustainability education community. The Engagement & Outreach Committee is dedicated to inviting collaboration from the many fields and endeavors that also support the vision as stated above. Additionally, the committee produces scheduled gatherings and shared tools on best practices and program development to support all the many public, private and nonprofit formal and informal ongoing educational efforts. The Place Committee is dedicated to measuring how much connectedness there is over time among residents as a whole population and among the many specific demographic and identity groups that make up the region. Want to learn more? Email the Conservation Education Leadership Council.